The last piece of 118 years of history was demolished yesterday in northern London's Tottenham district. Now the new stadium continues to rise and first four 'safe standing' seats are in place! Yesterday evening Tottenham informed that the very last visible piece of White Hart Lane was removed from the site. It was the remnant of south stand's ground level, last piece of 118 years of White Hart Lane's history. It took 2.5 months to demolish the entire stadium, following farewell ceremonies in mid-May. 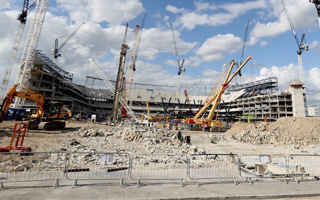 Although the new 61,000-seater is being built significantly to the north of its predecessor, all of the White Hart Lane plot will be part of the project. Under what used to be the south stand a unique garage is being created. On a daily basis it will serve as underground parking site beneath a major public plaza behind the new south stand. However, for concerts and American football games (at least 2 NFL fixtures per season over 10 years) the natural turf would slide exactly into this space. 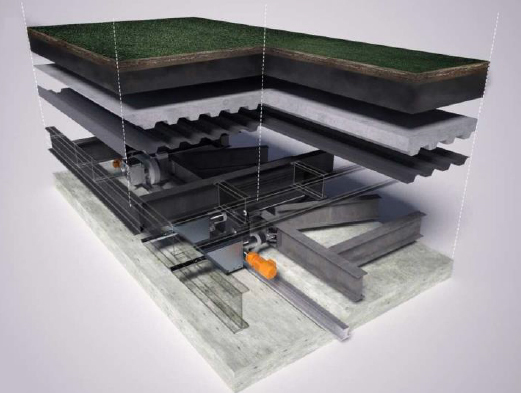 It's not only the first retractable field system in England, it's also the very first of its kind. At present the only sliding fields in use are all placed on a single platform, in one piece. This one will be divided into three parallel strips which will connect only once placed in the central position. In order to fit between the south stand's columns the field has to be split. Otherwise building the 17,000-seat single-tier stand with no central supports would be extremely challenging. While the last piece of old stadium was removed in the south, major changes are coming in the north. First, the steel outline of future roof is already visible, creating a halo above three tiers of seating. Second, the first four seats are installed in the north. Because they have railings attached, they were immediately rumoured to be a safe standing area and indeed Tottenham have confirmed that this is a trial for potential installation of safe standing, should the law change. The proposed model has major advantages as the seats are comfortable and don't need any work to meet UEFA all-seating requirements.